Well hello, March! When March comes around, we start thinking about the warmer weather, rainbows, and showers. But we can’t forget about the very lucky holiday, St. Patrick’s Day. Everything is green, clovers, leprechauns and pots of gold. 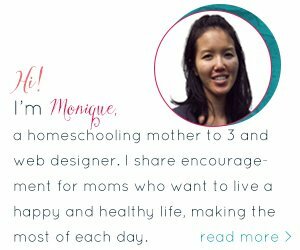 It is not necessarily a holiday that many people go crazy over celebrating but it is super extra fun with kids around! I mean, when you have kids any excuse to dress up fun, decorate and make extra special treats is reason enough! 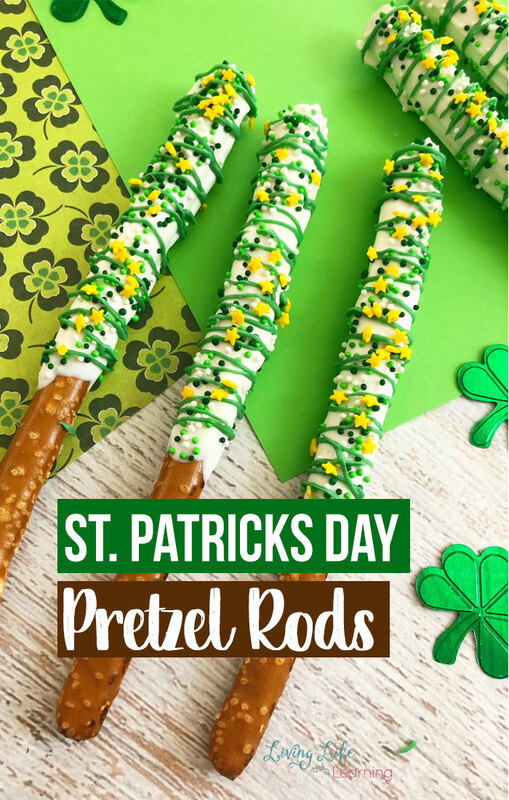 These St. Patrick’s Day Pretzel Rods are where it’s at! 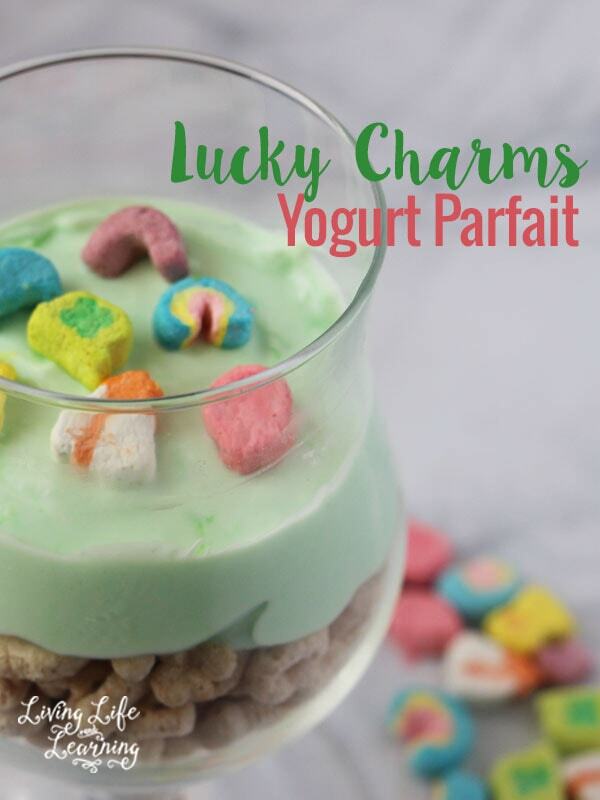 This St. Patrick’s Day treat is easy to make and are a delicious to snack on. I also love these because they make a great treat to give to friends, take to the classroom or give as a ‘we are lucky to have your gift for teachers. They are easily made with delicious melted chocolate, festive sprinkles and of course a green drizzle. 1. In a small microwave-safe bowl, melt your white candy melts on 50% power for 3 to 4 minutes, stirring every 30 seconds until melted. 2. 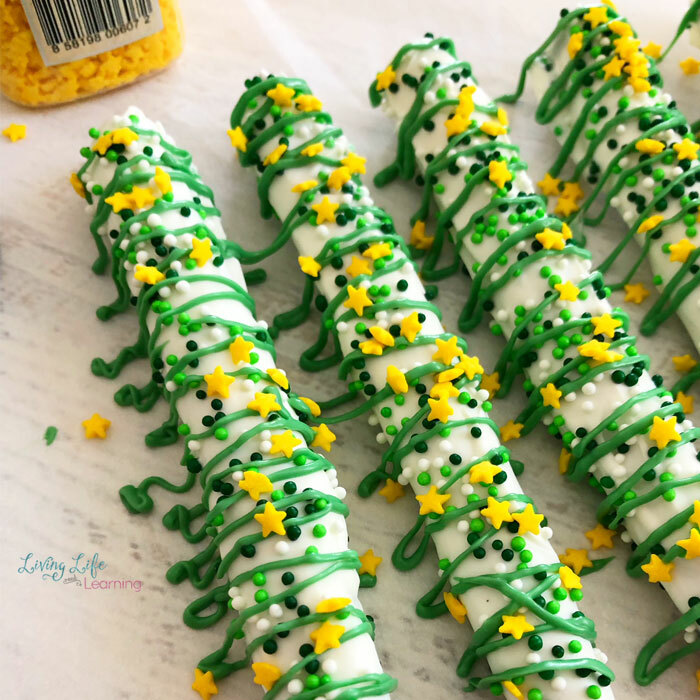 Pour your white chocolate into a tall glass, dip each pretzel rod into the tall glass and place the white chocolate covered pretzel rods onto a piece of parchment paper. 3. 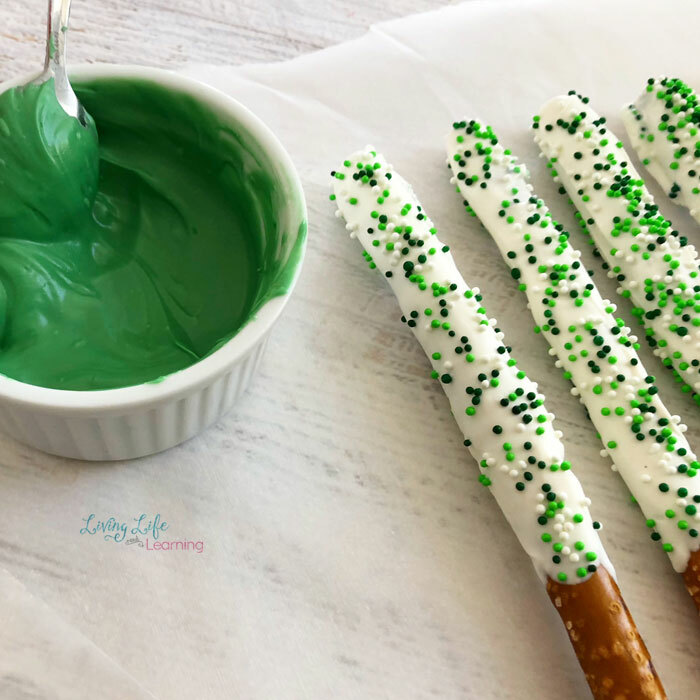 Top your pretzel rods with your green sprinkles and let harden. 4. In another small microwave-safe bowl, melt your green candy melts on 50% power for 3 to 4 minutes, stirring every 30 seconds until melted. And pour into a decorating bag. 4. 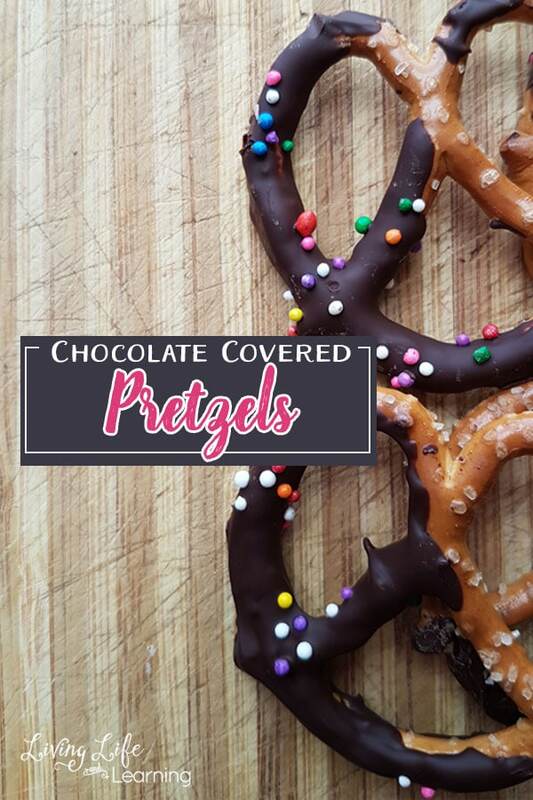 Cut the tip off the decorating bag and drizzle the green chocolate over the pretzels. 5. 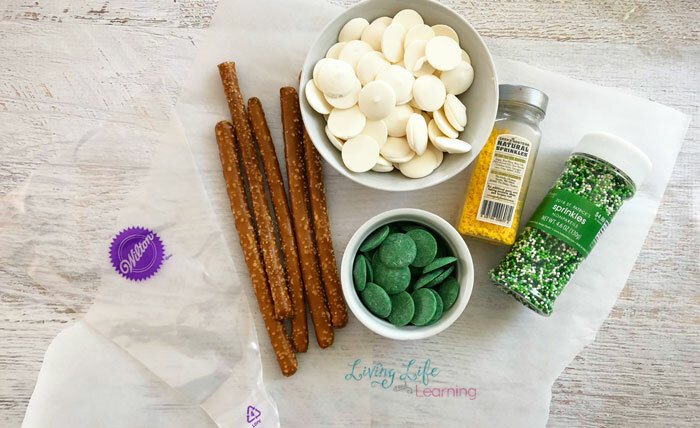 Sprinkle with yellow stars and transfer to a clean piece of parchment paper to harden fully. 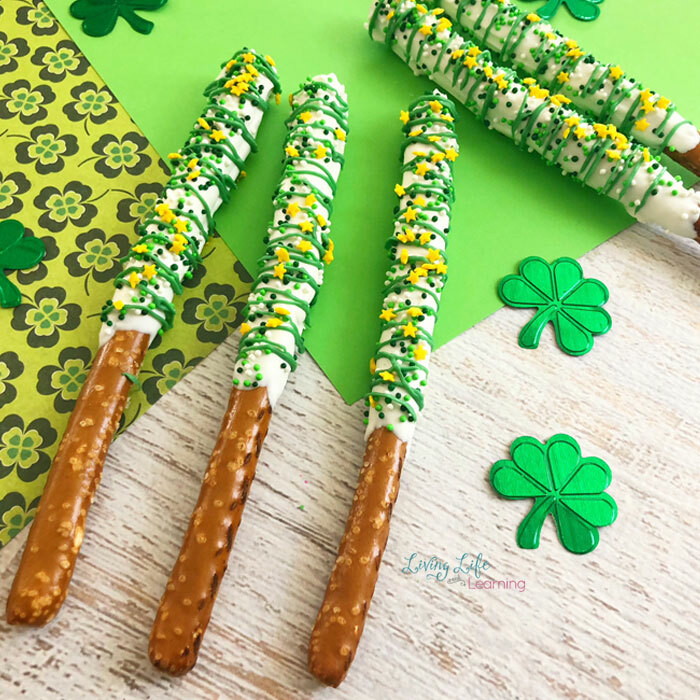 This is a perfect treat for the kids for St. Patrick’s day or any green themed event in your life.